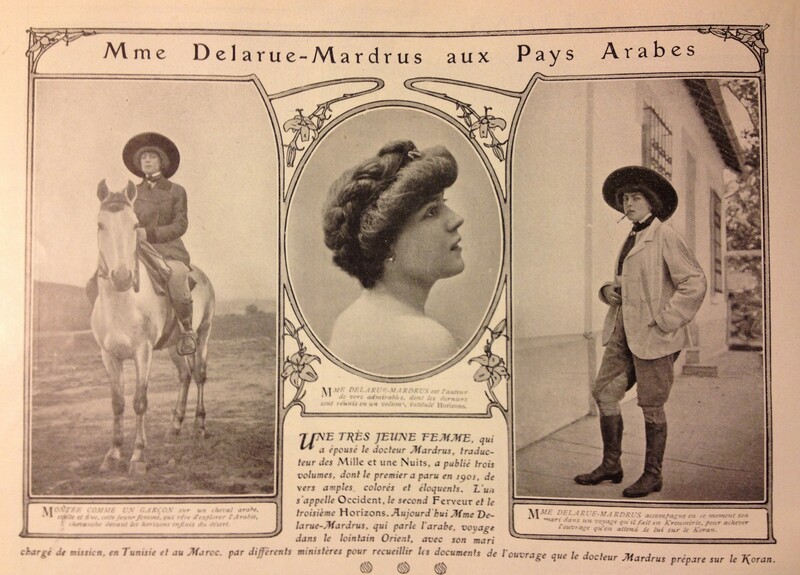 I purchased the September, 1905 issue of La Vie Heureuse because I was interested in the article about the writer Lucie Delarue-Mardrus’s travels (below) for my book, Having It All in the Belle Epoque. Young Lucie had married the charming Egyptian doctor Joseph-Charles Mardrus, already famous for his French translation of the Arabian nights, not long before they took off for Tunisia and Morocco. Lucie became famous herself during these travels, as the savvy doctor sent back to France photographs of his lovely, mysterious wife in North African garb, set against exotic vistas. Both La Vie Heureuse and Femina printed numerous photo spreads of the poetess, often alongside a poem or two, to be devoured by a public long fascinated by all that France had conquered. By the time the couple returned, Lucie was a media darling, on her way to becoming one of the best-selling women authors of the 1900s. Like her dear friend Myriam Harry, Lucie’s exotic costume changes seem to displace any anxiety about gender subversion onto the more palatable terrain of cultural subversion. It was virtually unimaginable in the pages of Femina and La Vie Heureuse to depict a woman wearing pants and smoking a cigarette– that was precisely the image of the “New Woman” that these magazines were trying to efface in their construction of a kinder, gentler, lovelier version of modern femininity. But put that woman in Kroumirie, and wearing pants is a way of not becoming a Tunisian woman hidden behind an oppressive veil or locked in a harem; wearing pants as she struts around freely serves, rather, as a playful reminder of French superiority over the exotic Orient, and that, alas, is a notion everyone seemed to agree on in 1905. Of course, the article also shows an elegant profile of the thoroughly European version of Lucie, as if to remind of the true woman, disguised as she was in the other images. This is the Lucie, after all, who has “authored the charming verses” adored by the magazine’s readers. But it’s that very multiplicity of female images that is so striking in La Vie Heureuse and in this issue in particular: despite the explicit and often constraining framework of upper bourgeois convention, a surprisingly multivalent image of the modern woman emerges. Like the Belle Epoque sportswomen I talked about in another post, the femme moderne is able to explore new forms of expression with remarkable flexibility. The images included here are all from a single issue of the magazine, September 1905. From the tightly corseted fisher-woman of the cover– managing that delicate balance of outdoorsiness and feminine artistry—we pass to a frontispiece with a rifle-toting countess, to the Smith College women’s basket-ball team; the exotic woman writer Delarue-Mardrus; and a feature on the first French women lawyers. It’s hard not to read, then, the final feature on the remarkable circus performer Miss Alethe, who has found “new and unexpected ways” to twist herself into lovely shapes with agility and strength, as a metaphor for the whole enterprise.